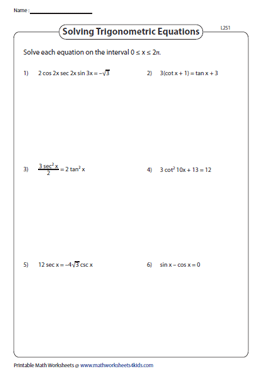 Boost learning parameters with these solving trigonometric equation worksheets featuring myriad exercises to solve trig equations in linear and quadratic forms by factoring or by using quadratic formulas. Learn to determine the principal solution of the given trigonometric equations as well. As a precursor to these exercises, the high-school students can recapitulate the trigonometric identities charts. 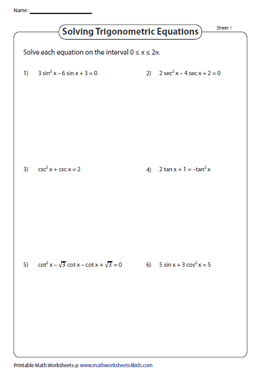 Access these trigonometric worksheets to solve simple trigonometric equations. 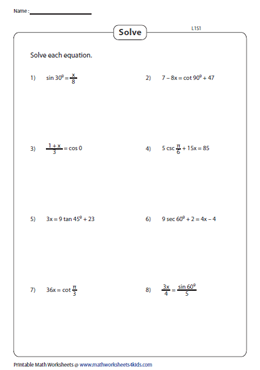 Each of these level 1 worksheets features trigonometric functions with special angles either in degree or in radians. Reinforce the concept of solving trigonometric equations by evaluating these equations that include two or more trig functions. 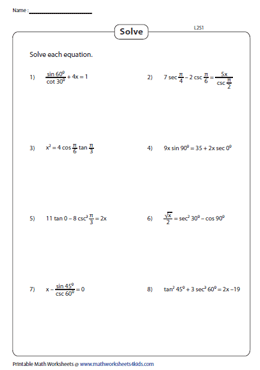 This batch of worksheets presents equations with a single trigonometric function. Solve the linear trigonometric equation and obtain principal solutions that lie in the given range. Modify the trigonometric equation by applying the standard trigonometric identities and express it in terms of a single trig function. Solve the equation and find out the principal solution of the given equation. 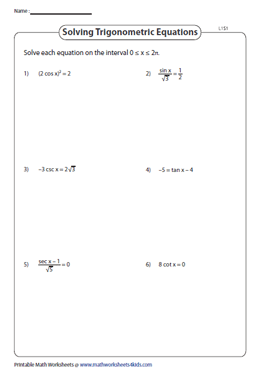 This array of trigonometric worksheets depicts trigonometric equations in the quadratic form. Factorize the expression by combining your algebraic skills and trigonometric identities and then solve the equation.